I moved to Woodstock, IL, in 1970, at age 23, for a good reason. I had landed my first adult job, as an English teacher at Woodstock High School. Woodstock was, at the time, a town of 10,000 people. Located 10 miles south of the Wisconsin border, it was — and I guess to some degree still is — more rural than suburban. We are the second to the last stop on the northwestern commuter train line. It’s about an hour and a half to Chicago, whether you’re on the train or in a car. Ha! No. Certainly not THAT Woodstock. My grad school friends at Duke University jokingly described Woodstock as a town lost in the obscurity of the Midwest. I didn’t argue with them. It didn’t matter anyway. I planned to stay a couple of years, then move on to a job closer to Chicago, maybe in Downers Grove or Oakbrook, where two of my college friends were teaching. The key question isn’t why I came to Woodstock. It’s why I stayed. Somehow, the years flowed by and I never left. I liked my job. I loved my coworkers, who became my friends and family. I liked being able to walk to school and yet being able to hop on a train to Chicago. So some time along the way, I made my peace with Woodstock’s off-the-beaten-path-ness. Even when I retired from teaching three decades later, I had no urge to leave. Much of our town, which now has a population of 25,000, is just plain charming. The older neighborhoods feature vintage Victorian homes. The center of Woodstock is a quaint Victorian town square. It is ringed with small shops and a few restaurants. The Woodstock Opera House, our center of culture, is also located there. In the center of the Square is a bandstand. Every Wednesday evening during the summer, our the city band plays a free concert there. Twice a week the Square hosts a farmers market during the growing season. 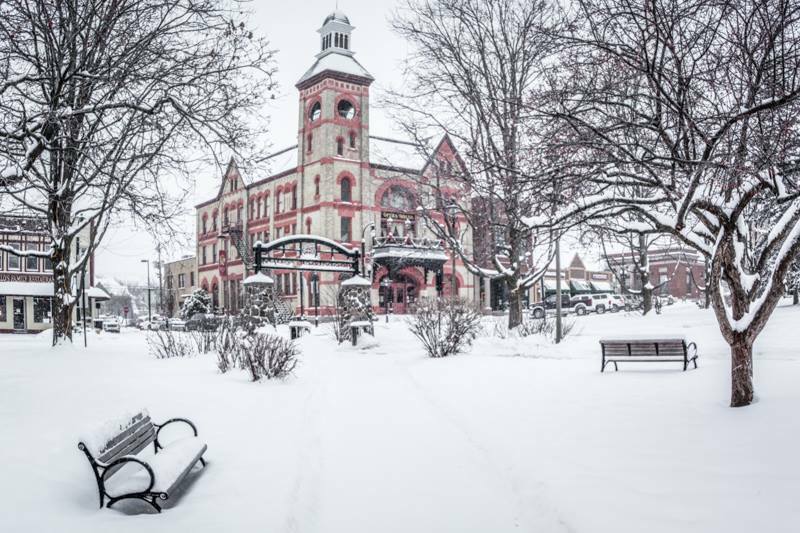 Here is how our Square looks in the winter. I’m not the only person who fell in love with Woodstock and stayed. Until recently, nearly half of the residents of Maples at the Sonatas moved here from other homes in Woodstock or had lived here earlier and returned. Now the percentage of Woodstockians is lower, due to a stronger web presence by Wilcox Communities that attracts buyers from around the country. For that reason and more, Woodstock is no longer a well-kept secret. A fair number of Boomers are heading to smaller towns or maybe small towns near larger cities. We thought … it would be interesting to see where Boomers are moving when they are not going to cities. We’ve developed a list of the top towns (between 10-50K population) in each state that are attracting the greatest number of people 50+… Small town charm but close enough to larger towns or cities to keep interesting. As you might guess, Woodstock made the list. That becomes more impressive when you consider that only one town was chosen per state. I would also like to acknowledge our sister Wilcox communities, Villas at Vale Park and Courtyards at Pepper Creek. Both are located in Valparaiso, which was selected as the top town in Indiana. Thanks for stopping by Home Sweet Abbey. I hope you'll find something you enjoy. To learn more about me and my blog, visit my About the author page by clicking it in the menu at the top of this page.